As you step aboard the ship, you will find yourself on the fantail. The fantail is the back or rear of a ship. The quarter deck is the area of the ship where the gangway comes aboard and where the ship’s watch is posted. The watch refers to the group of men actually on duty at any given time. The quarter deck watch is the sailor whose duty station is to stand guard at the gangway and control access to the ship. 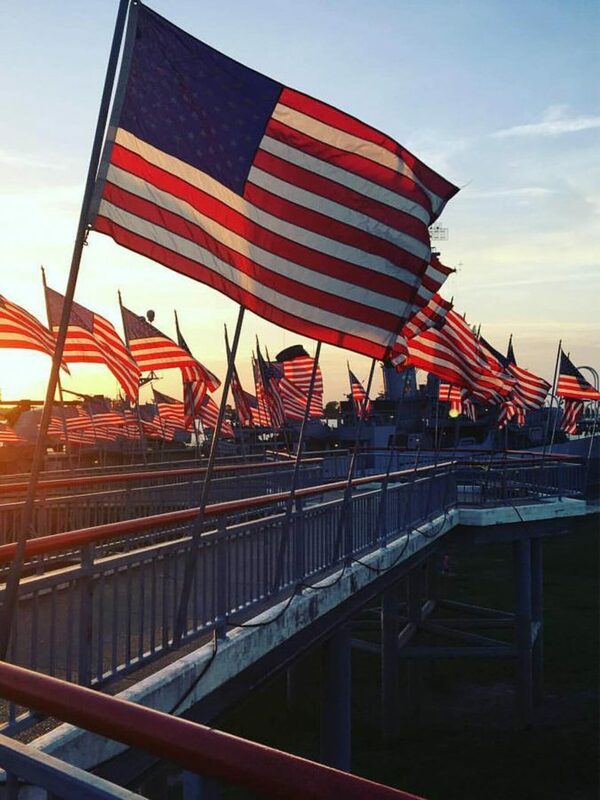 All parties coming aboard must gain permission from this sailor and all personnel coming or going from the ship are listed in the quarter deck logbook, along with the time of the occurrence. An easy distinction is this: the quarter deck can move to different areas of the ship; the fantail is always at the rear of the ship. 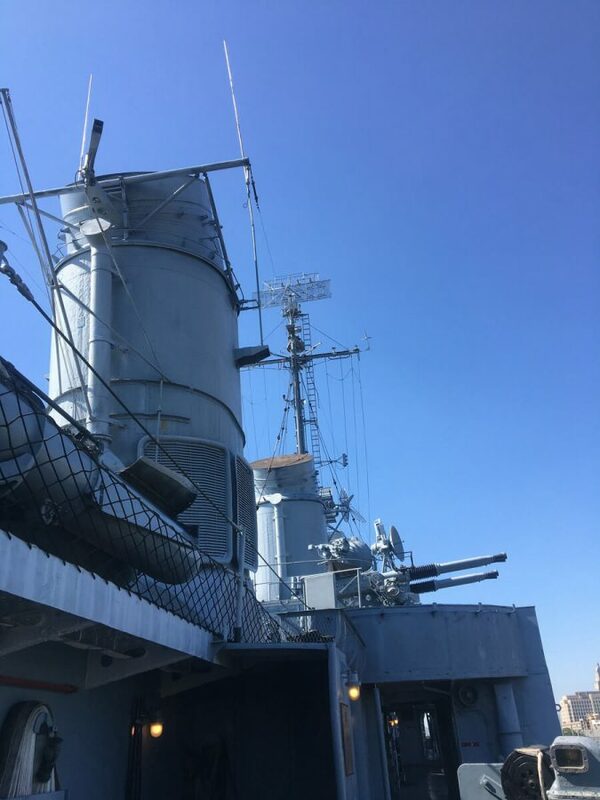 As our gangway currently comes aboard at the rear of the ship, the quarter deck is thus located on the fantail and is where our greeter stands watch..
You’ll notice quite a bit of equipment on the fantail. In fact, it has a very cluttered look to it what with anti-aircraft guns and depth charge tracks all over the place. This is how the KIDD’s fantail looked during the height of World War II. In later years during the Cold War, much of this equipment was removed, leaving the area looking quite bare. Also on the fantail is 5-inch Gun Mount 55. The KIDD carried five 5″/38-caliber gun mounts as her main battery. Numbered from forward to aft, they are Gun Mounts 51, 52, 53, 54, and 55. The term 5″/38 comes from the fact that the barrel diameter is 5 inches, and the barrel length is 38 times the diameter. The barrels are rifled, meaning that the interior is grooved, making the projectile spin as it is hurled from the gun. It uses semi-fixed ammunition, meaning that the “bullet” is in two pieces: the projectile and the powder casing which is used to fire the projectile from the gun. Fixed ammunition comes in one piece; powder casing and projectile all in one package. Each gun had a maximum range of approximately 54,600 feet (10.34 miles), firing at an angle of 45° with a 17-pound powder charge. Without a doubt, these guns were the most powerful and versatile weapons aboard the KIDD. They could be used in ship-to-ship combat, surface-to-air combat, and for shore bombardment. 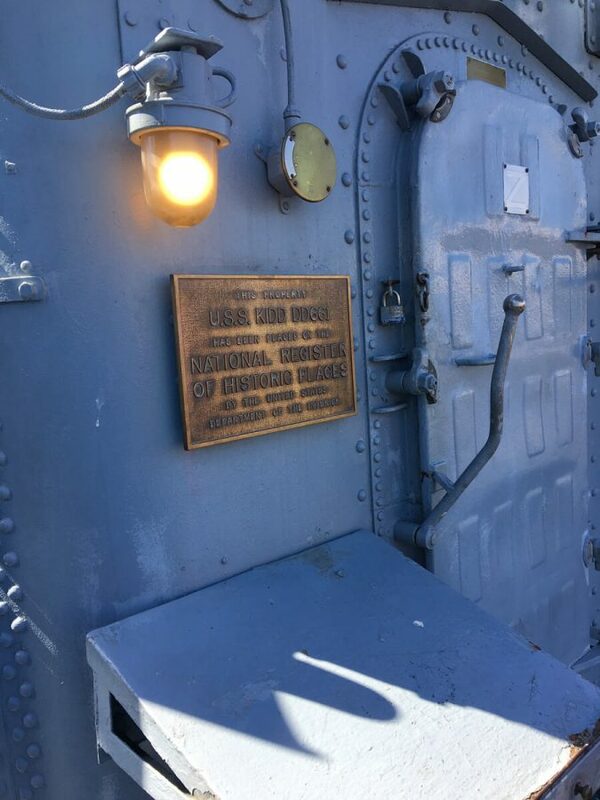 The 5-inch guns were controlled by the Mk-37 gun director located atop the pilothouse. Each mount, however, could go into “local” control, in which case each mount was trained and elevated manually by its crew in the event of power loss. 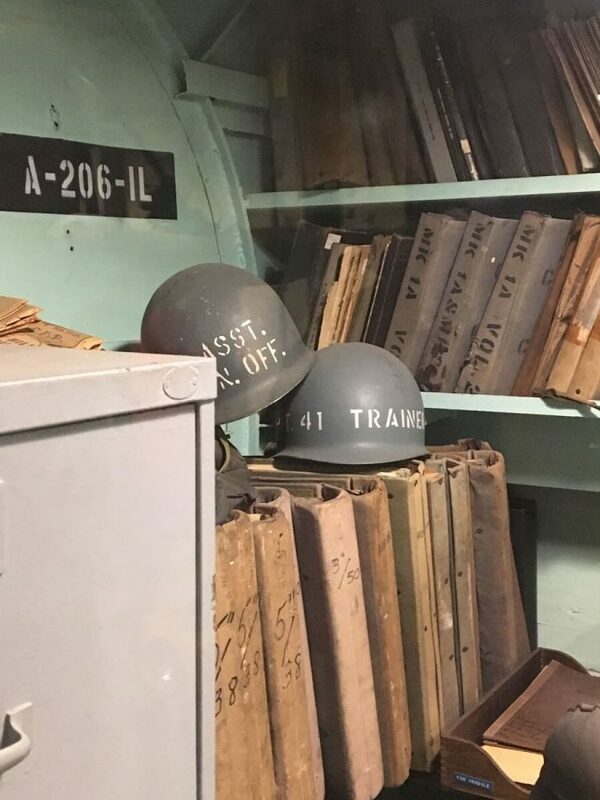 The interior of a 5-inch gun does not have much room to spare. Yet eleven (yes…eleven!!!) 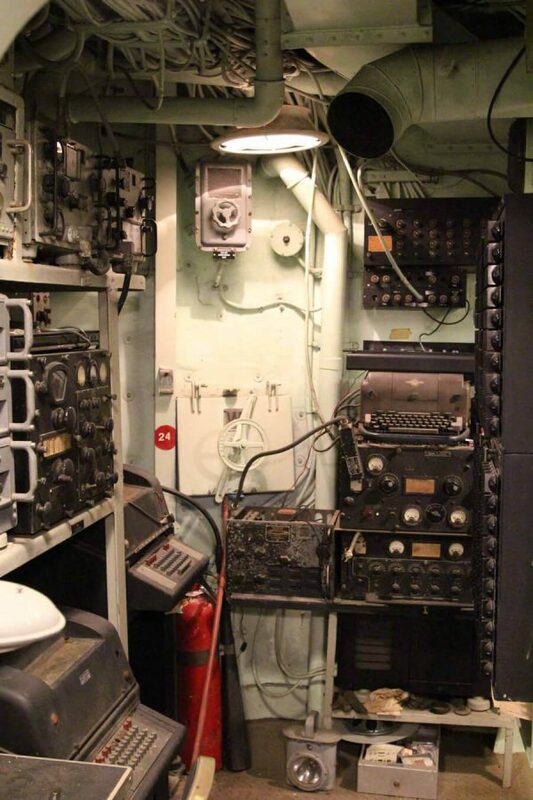 men worked as a team in these cramped quarters, firing an average of 15 rounds per minute. Oftentimes, however, the gun could function with a smaller crew. 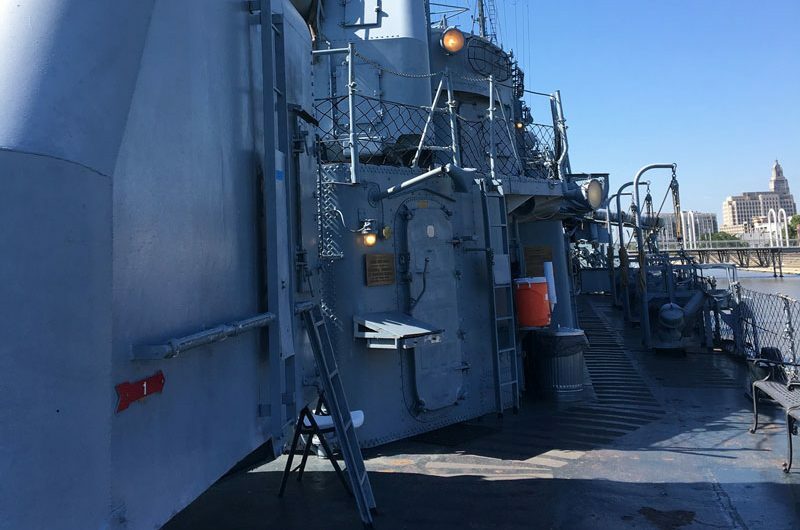 You can view the interior of Gun Mount 55 from your vantage point here at the quarterdeck.